Victorian Extravagance stained glass windows hanging in Dean's dining room. 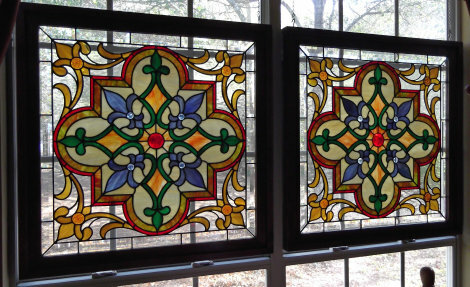 In April of 2012, I was searching Craigslist for stained glass tools and supplies for sale. 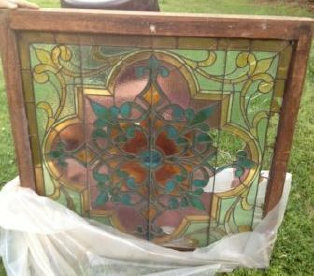 I stumbled across a damaged Victorian window for sale in DeKalb, Mississippi (picture to right). Unfortunately, the window was too big and too damaged to ship, and too far away to pick up. I kept a picture of this window and resolved that one day I would use some of the design ideas from this window. I really like some of the period features used in this window, particularly the multiple fleur-di-lis concept. When I finished building Victorian Extragagance, my wife loved it so much that she suggested that I build an exact duplicate, so we would have a "matched set". Having been married long enough to realize the value in my wife's "suggestions", I set about creating a duplicate. A month later, its mate was finished. Both windows now hang in our dining room, and every morning the sun shines through them as I drink my morning coffee. Everybody's happy ....isn't life great? 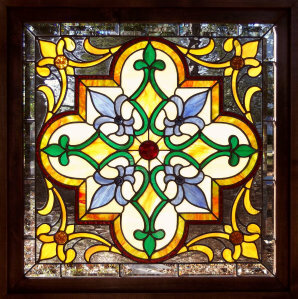 Each Victorian Extravagance window contains 260 pieces of glass, and measures approximately 30" x 30" in its stained and varnished Alder frame. The matched set is available for sale only as a set for $3550.00 ...... or I can build again in your choice of colors. The owner said the window had been in her family a long time. 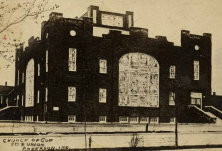 She found out that the window was purchased by Lucas V. Strickland in the late 1800's and came out of the Church of God in Anderson, Indiana (pictured on right). I have not been able to find out any additional information so far. Sure would appreciate input from anyone who may be able to clear up the mystery. Josh from Pikeville, Kentucky contacted me one year ago about a pattern for my Victorian Extravagance. 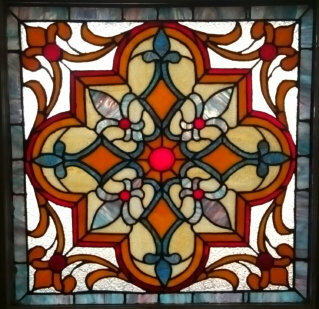 At the time, he had only a year experience in building stained glass. I encouraged, and maybe even challenged him a bit, to build something this complicated. This is definitely not a novice project! Josh recently sent a photo of his finished project. Wow.... looks like he is not a beginner any more! What an amazing job! He drew this without a pattern and did an awesome job at glass cutting and assembly. Josh's window measures 24" x 24" and was completed in October, 2016. I have 35 years experience at building glass and this was a complicated project, even for me. I'm at a bit of a loss now as to what to recommend to Josh for his next project. I have great confidence that he will be a fearless and talented stained glass artist! Good work, Josh!